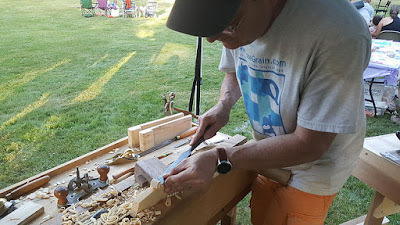 Demonstrating chisel usage at the Littleton Common Makers booth at Littleton's Third Thursday event in July. Littleton Common Makers, the makerspace in Littleton, MA where I run my free veterans woodworking program, is conducting a GoFundMe campaign in order to remain open for another year. Click here if you'd like to contribute. The goal of the funding is to cover rent and expenses, and add improved equipment to increase membership. Ultimately the goal is for the makerspace to be self-sustaining from membership. For now, the membership isn't large enough. It takes up-front investment to establish the space and bring in equipment and programs that will attract people. 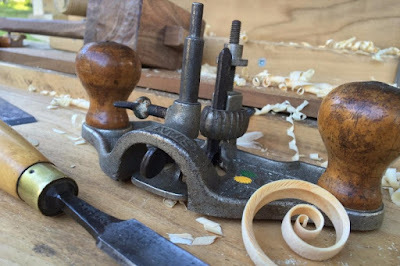 Some of the antique tools I use for teaching, with a few fun curls of wood. A makerspace is a shared community resource that makes tools, equipment, and workspace available to people who wouldn't normally have acceess to them. This includes tools for working metal, plastic, wood, and other materials, from antique woodworking hand tools to high-tech CNC and 3D printers, laser cutters, electronics, and robotics. It's all hands-on, learning how to apply skills and make things yourself. It's also a collaborative space, where people share knowledge and techniques. The multi-disciplinary, cross-functional environment stimulates all kinds of creative energy. See this page for more information and please help keep LCM open!